Bring a bit of balance back and treat our most important ‘balancers’ in life; our feet! In colder weather, the body is more prone to poor circulation and our feet often feel cold as a result. Oh the treat of immersing your feet in a warm foot bath, yes it is old fashioned but it has such a therapeutic benefit. Sage is a heat regulator so adding a drop of Sage oil will really help with the body’s thermostat whether you are too hot or too cold. A Sage footbath is great for bringing down the heat and hot energy from a busy head after a day of screens, devices and travel. Feet are so often condemned to a shadowy existence and spend all winter covered up, so set them free and allow them some pamper time. Your whole body and mind will feel the benefit. And the perfect way to prepare yourself for a cosy night’s sleep. Before your footbath, get your PJs on and stand upright in ‘Tadasna’ or mountain pose; raise arms up overhead as you inhale, pause, and exhale down, repeat this five times, now time for your footbath ritual. 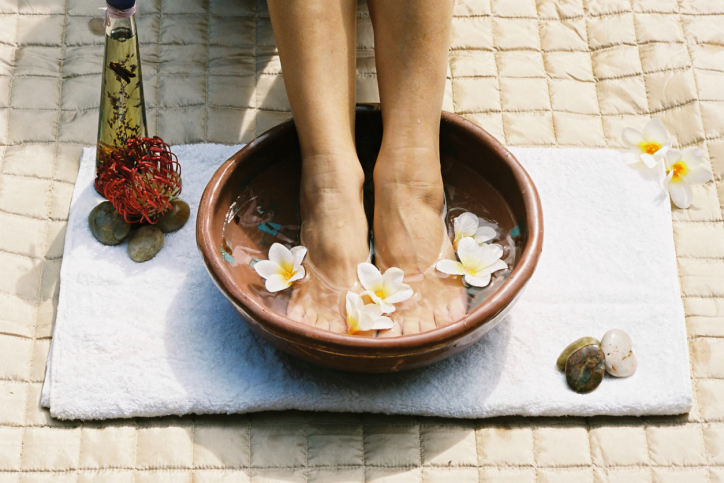 Have a warm towel ready to dry off your feet and finish with a nurturing foot balm. Top ingredient to look out for in foot balm: St John’s wort in organic form in ‘foot care’ will hydrate and literally lighten up heavy feet.